Graduation Projects are independent research projects that our seventh-grade students present to all students and school families on the day of their graduation. We're proud of the interesting topics selected by our former graduates, and the fine work performed in completing their projects. Many Graduation Projects include an audio-visual component. We invite all our graduates to submit their research papers or presentations to us for inclusion on this page. Ethan Cantor - Are Jews like the Luddites? Alyson Gruber — Aly's Paper of "Why"
Rachel Pollard — Jewish Charity: An Oxymoron? Simon Liebling — Atheism and Judaism: Baruch Atah Who? Max Mintz — What is the Good of Jewish Humor? 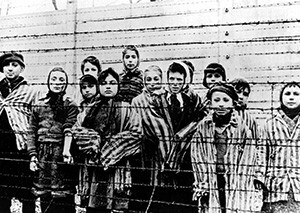 The Holocaust is one of the historical periods studied by our Level 4 (7th Grade) students. Following is a selection of poems written by our students on the subject. The Survivors - who fought back. 6 million can stand as many things. The one word that kills. The one word that killed me. All was dead and gone. There once was a man, a Jew. Nazis treated him like poo. Now the Holocaust is true.